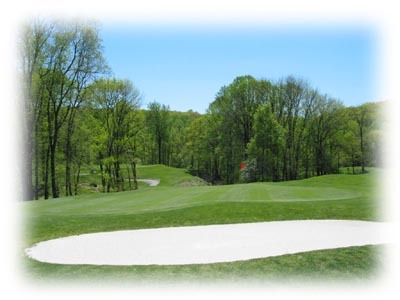 The finishing hole is an uphill par three over a tree lined ravine that requires an extra club. The green is surrounded by bunkers to the left and back. The 18th green slopes severely from back to front. A tee shot below and to right of the hole is required for your best chance at birdie. Par is a good score on this tough finishing hole. Time to head to the 19th hole inside the clubhouse straight ahead to celebrate the round!